• PLOT SUMMARY: His years in the jungle have taught him how to survive anywhere...and now the world's smallest super-hero, the Atom, is back in an ongoing series! Ray Palmer returns to the United States, leaving behind the South American jungle civilization and its people he had embraced in the Sword of the Atom mini-series. But the America he comes home to is different and it's all he can do to readjust to the changes. And that's to say nothing of the physical changes the Atom has undergone since he's been gone. 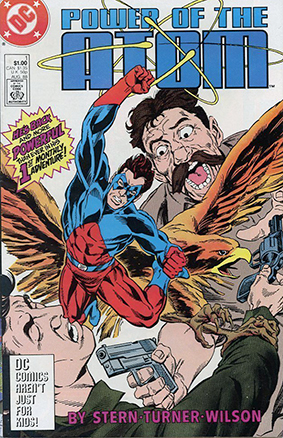 It's a whole new life of solid super-hero action for the Atom, brought to you by writer Roger Stern, penciller Dwayne Turner and inker Keith (Kez) Wilson. But before you step into the Atom's bold new future, you might want to take a look into his past, beginning as one of the premier super-heroes of comics' Silver Age - the story is told in the pages of Secret Origins (1986-1990 2nd Series) #29, written and drawn by Power of the Atom regulars Stern, Turner and Wilson.